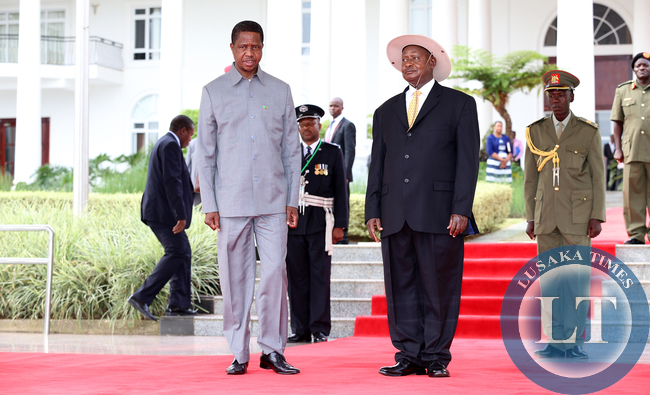 President Edgar Lungu and his Uganda counterpart Yoweri Museveni yesterday held a bilateral meeting at Uganda State House where the two discussed the possibility of introducing a new oil pipeline from Uganda up to Zambia’s Indeni Oil Refinery in Ndola to reduce the cost of importing the commodity from the Middle East. Airport in Uganda shortly before President Lungu and his delegation left for Lusaka around 11:00 hours Zambian time and 12:00 hours Uganda time. Mr Kalaba said President Lungu, who was given a military send-off by Uganda defence forces shortly before his departure for Lusaka, held a very fruitful bilateral meeting with President Museveni. “In the bilateral we discussed the issue of the oil pipeline. As you know, Uganda is beginning to start producing oil and as Zambia and we want to take advantage of Uganda producing this oil so that we can have a pipe line ran from Uganda to Indeni Refinery in Ndola. “That will reduce the cost of doing business in terms of the oil industry and make transactions cheaper for us in terms of fuel,” Mr Kalaba said. would be worked out by their technocrats from respective Ministries of Energy, National Planning and other stakeholders. Mr Kalaba said Zambia anticipate a very productive future with Uganda given the fact that there was more that was bringing the two countries together than what was dividing the two.Mr Kalaba said the two Heads of State also discussed the issue of opening up missions for the two countries. “Uganda is opening up an Embassy in Lusaka while Zambia too will open an Embassy in Uganda next year. “Currently, the Zambian High Commission to Uganda and Uganda High Commission to Zambia are operating in Tanzania,” Mr Kalaba said. comprises of countries such as Uganda, Kenya and Rwanda. “Zambia has been invited to be part of the Northern Corridor. After the August 11 General Elections in Zambia, we will immediately pursue this matter,” Mr Kalaba said. He said Zambia was grateful that President Lungu was invited by Mr Museveni for the Counter Terrorism Summit. “President Lungu has also invited by Israel Prime Minister Benjamin Netanyahu and this is an invitation that the Head of State will take up after the Election Campaigns. “We are hopeful that our relation with Uganda is blossoming and for us in Zambia, diplomatic credentials keep on being announced and that is good for Zambia,” Mr Kalaba said. He was happy that President Lungu was the only leader from Southern African Development Community (SADC) countries who was invited to the Summit which he described as auspicious meeting. “We feel humbled as Zambia that President Lungu is being recognised to meetings such as these and this shows the place that Zambia has in the region and on the international scene.This was a very productive visit that President Lungu undertook to Uganda,” Mr Kalaba said. What about the cheap oil from Saudi Arabia that we were promised? When is it coming? A recently completed oil pipeline from Durban to Johannesburg cost R6bn thats a distance of 570km. This joker who can not even buy medicine for UTH thinks he can build one from Uganda to Ndola. And who said you can’t source crude oil from multiple sources? For National energy security reasons, it is always prudent to have multiple partners who can supply you with this vital resource if one acts up. In fact, I feel the pipe line from Uganda, if at all is built, should end up in NP or MP. Build a new refinery there so you don’t put “all the eggs in one basket”, as the saying goes. This can be part of the job creation program and would help reduce the rolls of the unemployed. Keep Indeni supplied by Middle East oil but on a reduced capacity. What the f*ck are you blabbing? Look at the map and, if you have even small bit of intelligence left, you will realize extent of your and your idol stupidity!!! TO ALL DULL PF SUPPORTERS INCLUDING KALABA & LUNGU: THE CONFIGURATION OF THE REFINERY WOULDN’T ALLOW THE CRUDE OIL FROM UGANDA TO PROCESSED AT OUR REFINERY. YOU FIRST NEED TO INSTALL ANOTHER UNIT CALLED HYDRO CRACKER WHICH WOULD BE LIKE ANOTHER REFINERY. OUR REFINERY CAN ONLY HANDLE SEMI-PROCESSED PRODUCTS. UGANDA HASN’T EVEN STARTED PRODUCING OIL AS SOMEONE HAS ALREADY POINTED OUT. @born free: I really try to engage people maturely and respectfully, even those I disagree with. Because unprovoked insults are the HALLMARK OF INTELLECTUALLY CHALLENGED !D!OTS TRYING TO PASS FOR BRAINIACS—only small minds with little to contribute to the discourse reduce themselves to the level of the UNCIVILIZED NEANDERTHALS like yourself! Now, I know and have re-look at the map of this region and I still can’t figure out what point you were trying to make. Because I do know infrastructure of this sort are always constructed across some “GEOGRAPHY” on this Earth and not on Mars. So what the freaking H3LL is your point? Mushendoor obe!!! HH will conduct a feasibility and do that if viable. sorry, it is too late now to talk about this and that. No wonder you are busy renaming universities and hospitals that don’t exist. What is important is if benefits from such meetings trickle to the common man. Also I have noticed that all leaders that come from whatever meeting abroad, they all say the meetings were successful, there is no meeting that has been unsuccessful. Is it the water or air at State House that dims the wits of its occupant? This must be one of the worst cases of daydreaming adults broadcasting their silly thoughts. These two dictators are hallucinating. This is only second to KK and his daft plan to produce oil from grass. …make money once the oil deal is finally completed between the two countries (i.e. transporting that oil into Zambia.) At least that’s what I understand the facts are. And deals of this magnitude takes time and a lot of meetings and talking for them to be finalised. We are NOT talking about buying cows from HH’s ranches here. These deals go beyond just the geopolitics of the two countries alone. There are other powerful players involved in this business for someone to just snap their fingers and it is done. Get it you perpetual complainers!? Bafikallaaa are not even campaigning because they are pinning their hopes on ringing. It won’t work, already one of PF’s rigging strategist partners are currently on fire who have had enough of the nonsense of mugabe!! Please Museveni help our beloved presido do what you do to extend your presidency there so as to silence our under5 politician, Haivotela Hunomwala. The talks in Angola were successful, In Saudi Arabia they were successful and now in Uganda they were successful.Now tell us who is going to supply us with cheap oil and when? Where is money for feasibility study, never mind actual construction!!! How many pipe lines are going to feed into Indeni? Not long ago we were assured of cheap oil from Saudi Arabia and earlier we assured of oil from Angola. Just shows that all these are plain lies meant to cover rigging meetings. A headless chicken runs around blindly!! @Chunda Ronard – So you know that Kaminamisa cant win the election without rigging. Prepare to live you sundew… pukucwe munyelela siliba. All of a sudden Uganda has become a good partner in development. Kikikikikikikikikiki. Mu7 Rigging consultant. What about rigging? What was agreed? Bakiiikaaaala! Even the usual sontapo PF vuvuzelas are feeling embarrassed to sontapo about a pipeline from Angola after we were told of one from Angola. Chi oneni chi Lungu kumanso kwati ni chi shell cha Crude Oil. Kaili manje these are the last days for him in office,he is now looking for Travelling allowances and other benefits.If you have noticed he has been travelling a lot of late, the next trip will be to zimbabwe to see mugabe and they will now tell us that the meeting to fill up lake Kariba has been successful. This one is a total sham! !Now one would agree with those suggesting that Uganda is helping Lungu to plan something sinister!How can one go to plan importing oil from a country that has not even produced a single barrel?How can you leave Angola a near by, already renowned oil producer and start a wild goose chase far away off?How can one even start thinking of being part of the Northern Corridor which does not feed into Zambia’s transport system? Looking for ways to waste money and giving jobs to cadres Lungu is thinking of opening a High Commission in Uganda! Zambia doesn’t need that! We have adequate representation which can be directed from either Kenya or Tanzania. Nothing justifies establishing this High Commission-we must be talking about cutting on the number of missions. They want to share spoils of Zambia tax payer money for helping him with tips on how to rig the upcoming elections. Its gets worse everyday …this what happens when you mix dullness and alcohol equates to folly of the highest order. You do not need a pass in elementary geography to laugh at what these scum bags are thinking. Pipe line from Uganda. In between is Tanzania, Burundu and Rwanda and lake tanganyiya. Have they got agreements with these countries for the pipeline. Dimwits! Brainless! LT, please proof read! I still can’t get the meaning out of this sentence: “President Lungu has also invited by Israel Prime Minister Benjamin Netanyahu and this is an invitation that the Head of State will take up after the Election Campaigns.” Who invited who? Owe! yangu! Its a snakily constructed sentence that is so snaky one can’t follow it kekekekeke! That sentence was specifically made for the likes of Chunda Ronard, Zebige, Yambayamba and other members of PF intelligentsia (LOL)!!! Lol ,it looks like Zambia needs to build a pipeline to commonsense 1st . Both Mr Kalaba and LT don’t seem to know what they’re talking about with poorly thought out proposals and LT’s poorly contructed grammar. Welcome to Zambia, the land of dullards and dimwits! President Lungu and Museven are just planning to connect this pipeline with the TAZAMA one which start in Dar es salaam,so the needed pipeline to be constructed is only about 200km from Tanga-Dar es salaam and then to Ndola.